Areas of Specialty: Dr. Brown is a board certified anesthesiologist, statistician and neuroscientist. Clinical Care and Research Activities: Dr. Brown’s primary clinical care activities are delivering direct anesthesia care and supervising anesthesiology residents on the General Surgery Service at Massachusetts General Hospital. 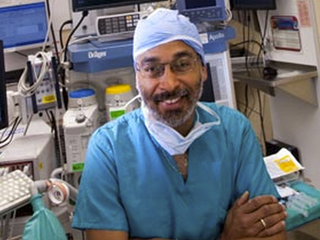 In his experimental research Dr. Brown uses fMRI, EEG, neurophysiological recordings, signal processing methods and mathematical modeling in interdisciplinary collaborations with investigators at Massachusetts General Hospital, the Health Sciences and Technology Program and the Department of Brain and Cognitive Sciences at MIT and at Boston University to study how anesthetic drugs act in the brain to create the state of general anesthesia. The long-term goal of this research is to establish a neurophysiological definition of general anesthesia, safer, site-specific anesthetic drugs and to develop better neurophysiologically-based methods of tracking the states of the brain under general anesthesia. In his statistical research Dr. Brown develops signal processing algorithms and statistical methods to study how the brain represents and transmits information. He has used the methods to characterize the dynamics of neural activity in the hippocampus during learning, measure the period of the human circadian pacemaker (biological clock), characterize the dynamics of learning and behavioral changes from binary-time series, designing algorithms for neural prosthetic control, improve signal extraction for two-photo calcium imaging, fMRI, EEG and MEG recordings, and characterize the dynamics of human heart beats. Dr. Brown’s unique experiences as a practicing anesthesiologist, statistician and neuroscientist bring important breadth and perspective to the SmartTots Scientific Advisory Board. Kim S, Putrino D, Ghosh S, Brown EN. A Granger causality measure for point process models of ensemble neural spiking activity. PLoS Computational Biology 2011, In Press. Plourde E, Delgutte B, Brown EN. A point process model for auditory neurons considering both their intrinsic dynamics and the spectro-temporal properties of an extrinsic signal. IEEE Transactions of Biomedical Engineering 2011, In Press. Krishnaswamy P, Brown EN, Herr H. Human leg model predicts ankle muscle-tendon morphology, state, roles and energetics in walking. PLoS Computational Biology 2011, In Press. Brown EN, Purdon PL, Van Dort C. General anesthesia and altered states of arousal: a systems neuroscience analysis. Annual Review of Neuroscience 2011, In Press. Brown EN, Lydic R, Schiff ND. General anesthesia, sleep and coma. New England Journal of Medicine 2010;363: 2638-2650. Ching S, Cimenser A, Purdon PL, Brown EN, Kopell NJ. Thalamocortical model for a propofol-induced alpha rhythm associated with loss of consciousness.Proceedings of the National Academy of Sciences 2010;107(52): 22665-70. Purdon PL, Pierce ET, Bonmassar G, Walsh JL, Harrell PG, Kwo J, Deschler D, Barlow M, Merhar RC, Lamus C, Mullaly CM, Sullivan M, Maginnis S, Skoniecki D, Higgins H, Brown EN. Simultaneous electroencephalography and functional magnetic resonance imaging of general anesthesia. Ann N Y Acad Sci 2009;1157:61-70.